Taiwanese company Foxconn, the maker of most of the worlds electronics and our favorite gaming consoles, announced that it had raised the wages of junior level factory workers in Shenzhen from 1,800RMB (US$290) to 2,200RMB ($349) a month. The move to raise wages comes at no surprise as Foxconn and many of Apple's suppliers in China have come under scrutiny over employee treatment practices. 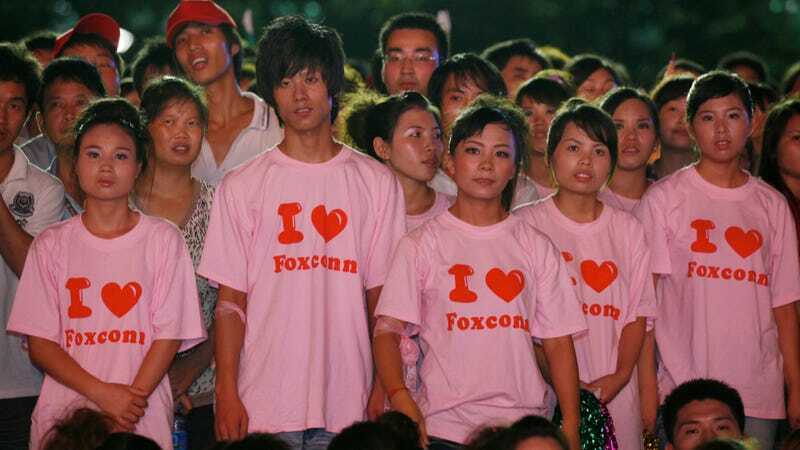 Foxconn itself has been under the public eye since a series of suicides by young workers during the summer of 2010. Reuters reported that this is the third time that Foxconn has reportedly raised its base wages for junior level factory workers since 2010. According to Reuters, the pay at Foxconn three years ago was only 900RMB ($142). "As a top manufacturing company in China, the basic salary of junior workers in all of Foxconn's China factories is already far higher than the minimum wage set by all local governments," the statement said. "We will provide more training opportunities and learning time, and will continuously enhance technology, efficiency and salary, so as to set a good example for the Chinese manufacturing industry." While at the surface Foxconn only looks to be raising wages because of the recent reports by US media on Foxconn's business practices, another less known reasoning behind the wage is recruitment and the flow of workers. Many Foxconn factory workers are not lifers. According to the China Daily, back in 2010 the monthly turn over rate for ground level factory employees at Foxconn's Shenzhen plant is at 5%. While 5% looks like a small number, Foxconn's Shenzhen plant employs 420,000 people in Shenzhen, that is almost the size some small US cities (for those of you who can't do the math, that's 21,000 people that leave Foxconn a month). Despite the huge turnover rates, suicides, and all around bad press, Foxconn Shenzhen still has millions of migrant workers clamoring to work for the company. That isn't the case for its plants that are moving inland. According to China Daily again, the move for having factories move inland is because it has become too expensive to continue in Shenzhen. The pay rate at Foxconn Hebei (in north China) is only 1,080RMB a month. Another motivator to moving inland and raising Shenzhen wages is the yearly Chinese phenomenon known as the Spring Festival Holiday rush (春运). It is estimated over 100 million migrant workers from all over China traveled from where they worked back to their home towns during the Spring Festival (or Lunar New Year). Generally during the time of the Spring Festival, all of China hits a slump in terms of productivity. The Airports and Train Stations are mobbed with people trying to get tickets to go home and spend the festival with their families. Foxconn is not immune from this phenomenon. Foxconn's pay increase also comes at a time when the cost of living in Shenzhen has gone up. The rise in the cost of living in Shenzhen hasn't reached Beijing or Shanghai levels but it is increasing. Whatever the reasoning is behind the wage increase by Foxconn, it could just be a manifestation of multiple factors—from the increase in cost of living along Shenzhen, to just the overall development of China—our favorite toys might now longer be made for cheap in China.